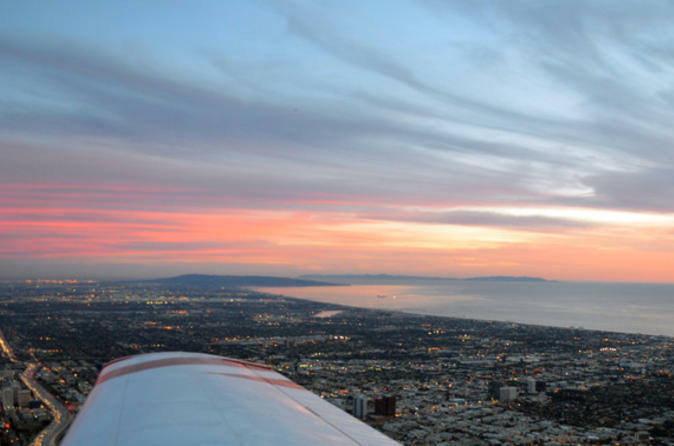 It’s hard to see all the attractions of sprawling Los Angeles in one trip, but this exciting airplane sightseeing tour makes it easy to capture the city’s landmarks and beautiful scenery in just one hour. Fly over the famous suburbs of Santa Monica, Beverly Hills and the Hollywood Hills; admire gorgeous Pacific coast views from Malibu; see the Hollywood Sign, movie studios and the Griffith Observatory; and look down on UCLA, USC, the Staples Center and Dodger Stadium. After checking in at Van Nuys Airport, relax before your flightseeing tour with provided beverages and snacks. Then meet your professional pilot, and begin your 60-minute aerial adventure by heading south, following I-405 toward the Getty Center. From the vantage point of your 3-passenger airplane, you have fabulous views of stunning coastal communities like Malibu and Pacific Palisades. Soar over Santa Monica and admire the view of the bustling Santa Monica Pier. Look down on Marina del Rey before flying east toward downtown Los Angeles, enjoying views of Westwood, UCLA, Century City, Beverly Hills and Hollywood. As you make a figure eight around downtown, see USC, the Coliseum, the Staples Center and Dodger Stadium. Next, zoom north toward the Hollywood Hills to see the iconic Hollywood Sign, Griffith Observatory and the Hollywood Bowl. Check out the Greek Theatre, Universal Studios and the NBC Universal building before following the 101 back to Van Nuys Airport, where your air tour comes to an end.